Tobi is one of the playhouses in the Explore series which has many activities in a limited space. Tobi requires an area of just under 7 x 6 metres. A safety surface is not necessary, so the playhouse can stand on grass. 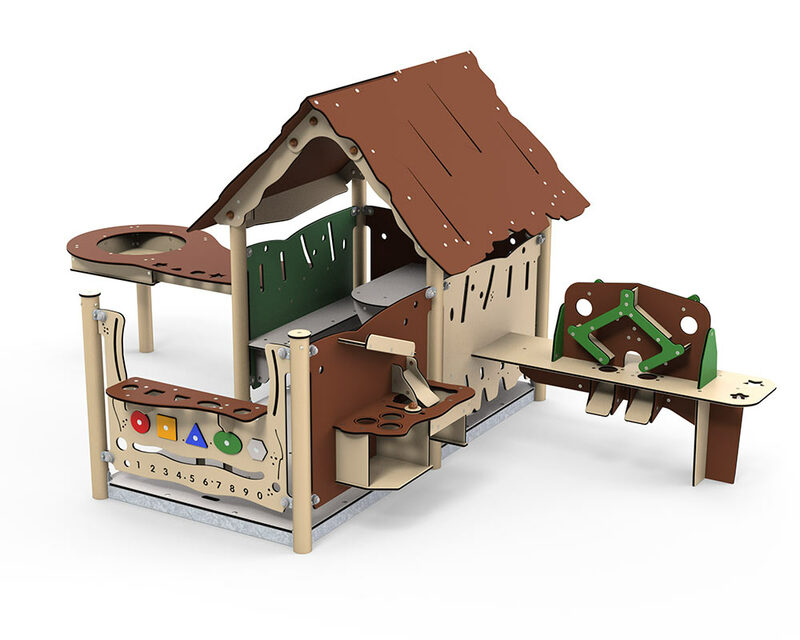 In addition to two standard benches and the table inside the playhouse, Tobi is also equipped with a veranda, which provides more play space as well as making it easier to enter and leave the playhouse. At the same time, the kiosk play panel inspires kiosk role-play. Role-playing is important for children’s development, because it enables them to live out experiences from their own daily lives. In this way, they learn about social rules and compromising as well as conflict-resolution. Tobi has a kitchen on the outer side of the veranda. The kitchen has many small activities that train children’s fine motor skills while stimulating their creative and cognitive development. At the same time, the kitchen is also one of the elements which inspires most role-play. On one side of the playhouse there is a splash table, and on the other a sand machine. Several children can play together with water and sand at the splash table, which stimulates their sense of touch and fine motor skills. In the case of the sand machine, it is the children’s cooperative skills that are put to the test, as they need to fill buckets with sand and carry them to the splash table.